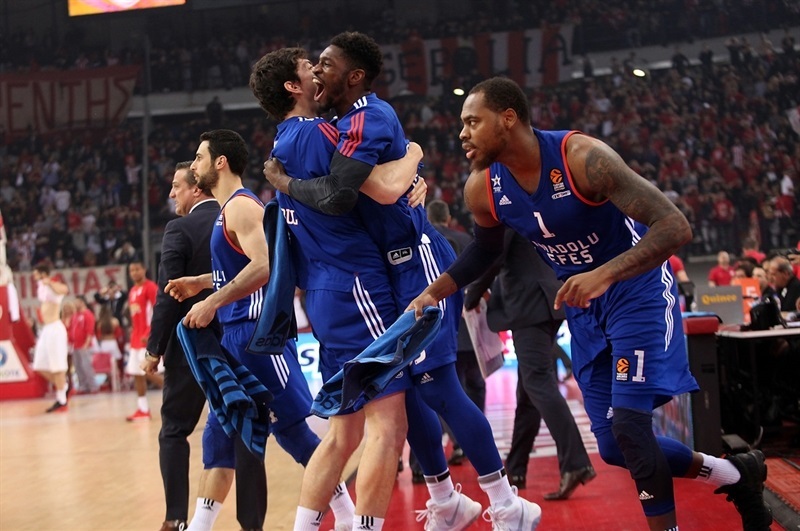 Anadolu Efes Istanbul won a Turkish Airlines EuroLeague Playoffs game on the road for the first time in club history on Friday to even its best-of-five series against Olympiacos Piraeus 1-1. 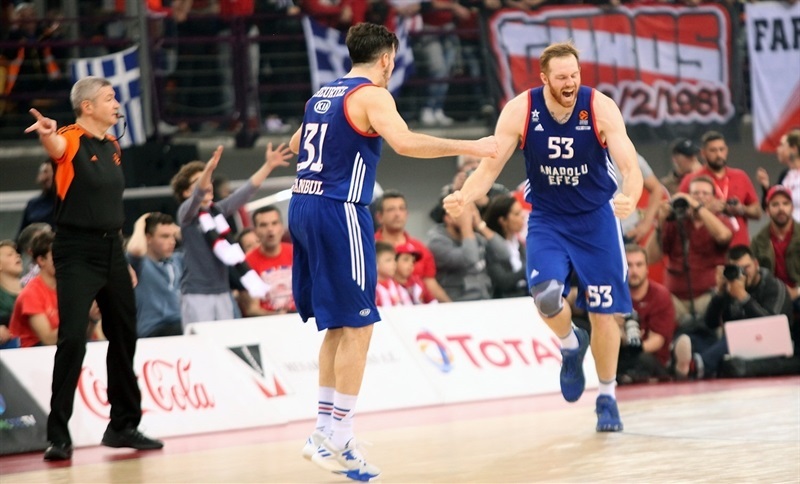 Alex Kirk’s baseline jumper with 48 seconds remaining proved to be the difference as Efes edged Olympiacos 71-73 at Peace & Friendship Stadium on Friday. 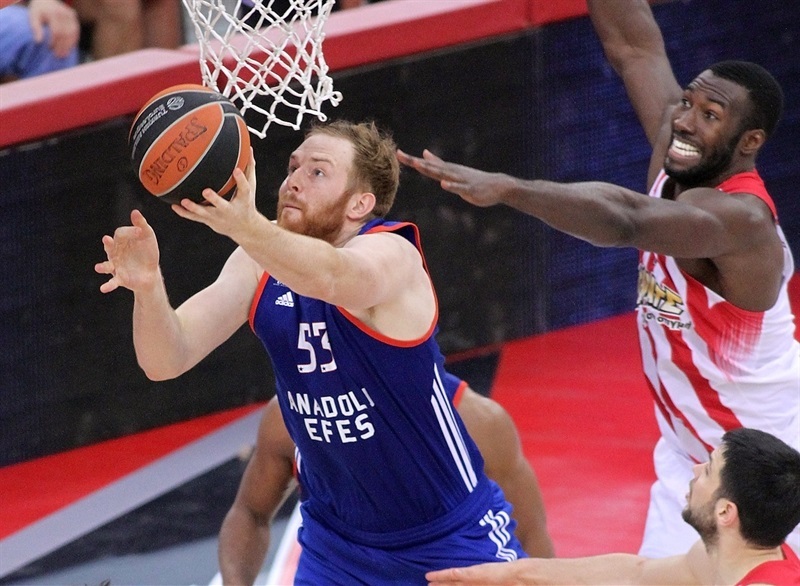 Efes hosts Games 3 and 4 in Istanbul next week. 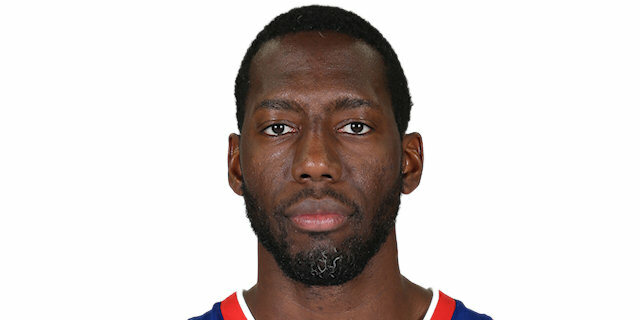 Bryant Dunston posted 16 points, 5 assists and 2 blocks to lead Efes. Tyler Honeycutt added 15 points and 9 rebounds and Jayson Granger totaled 9 points and 9 assists. 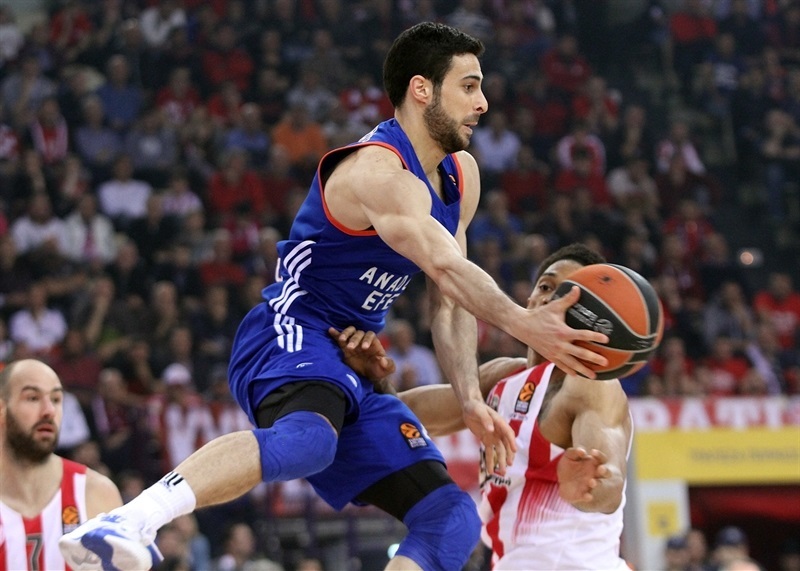 Efes made 60.5% of its two-point shots (23 of 38) and only committed 9 turnovers in two of the keys to the victory. 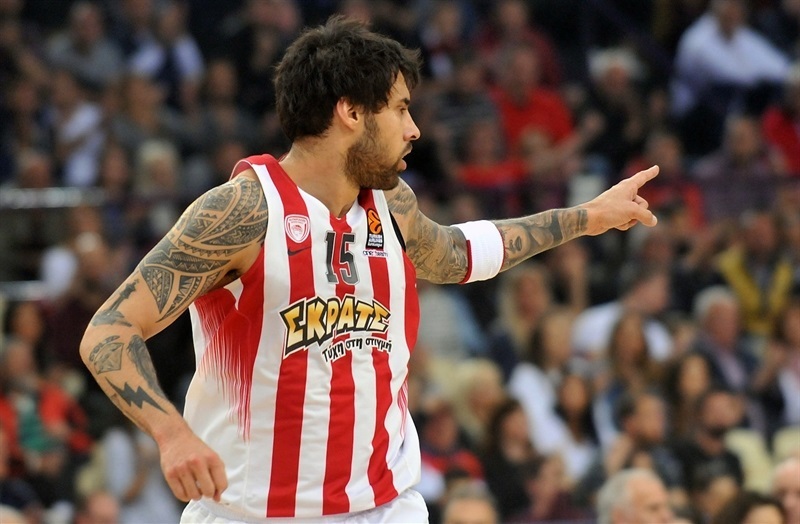 Vassilis Spanoulis and Georgios Printezis scored 20 points apiece and Erick Green added 10 for the Reds. 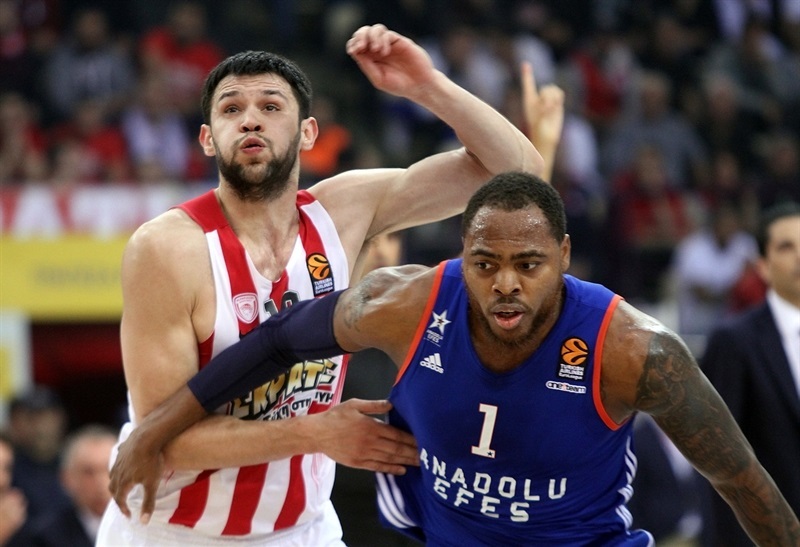 Efes started strong with the game’s first 6 points, punctuated by Jayson Granger’s steal and long assist to Derrick Brown for a slam, but Nikola Milutinov soon got involved with a put-back slam at one end and a block at the other. Threes by Spanoulis and Ioannis Papapetrou tied the game at 8-8. Printezis connected from downtown to give the Reds their first lead, 11-10. The lead changed hands several times before Printezis drew an unsportsmanlike foul and turned it into 4 points and a 22-19 advantage, but Brandon Paul and Alex Kirk came off the bench to put the visitors ahead 22-23 after 10 minutes. The Reds kept close and nosed ahead on 5 straight points by Green to lead 30-27. After a timeout, Paul hit a three to tie the score, but Spanoulis’s third and fourth triples had the hosts back ahead, 36-33. And his fifth made it 44-37 at the break. 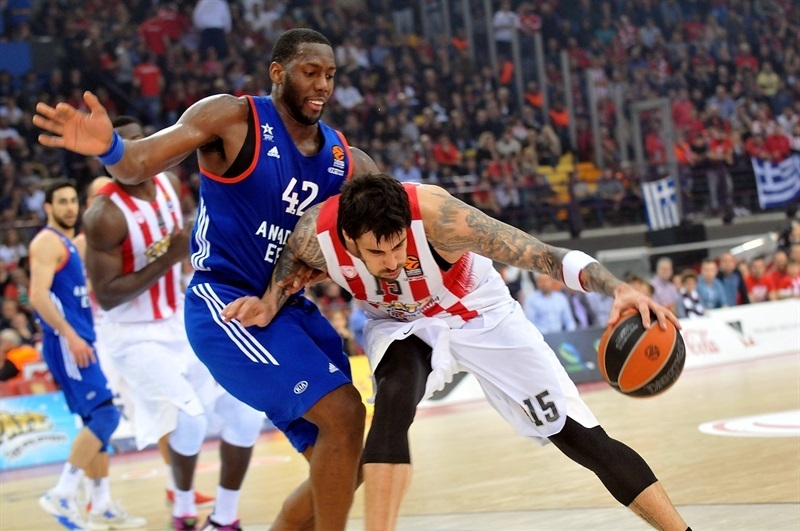 Efes kept Olympiacos scoreless for the first four minutes of the second half to get within 3. 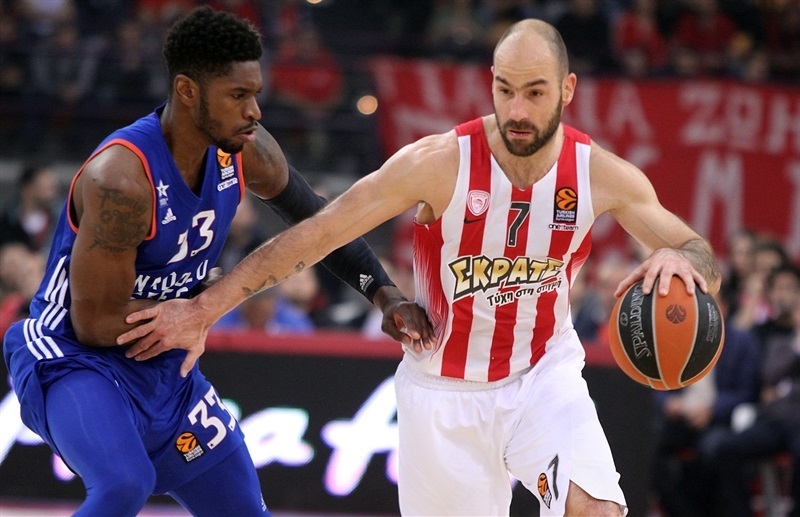 Baskets inside by Patric Young and Printezis protected the Olympiacos lead, but Honeycutt drained a three-pointer to make it 51-48. Kirk’s second-chance bucket ended the third quarter with 54-51 on the scoreboard. Honeycutt tied it with the first shot of the fourth quarter and then gave Efes its first lead since the first half with a baseline jumper that made it 54-56. Green connected from downtown to return the lead to the Reds and Spanoulis drilled his sixth triple, which tied his career high, to make it 65-58 with five minutes remaining. 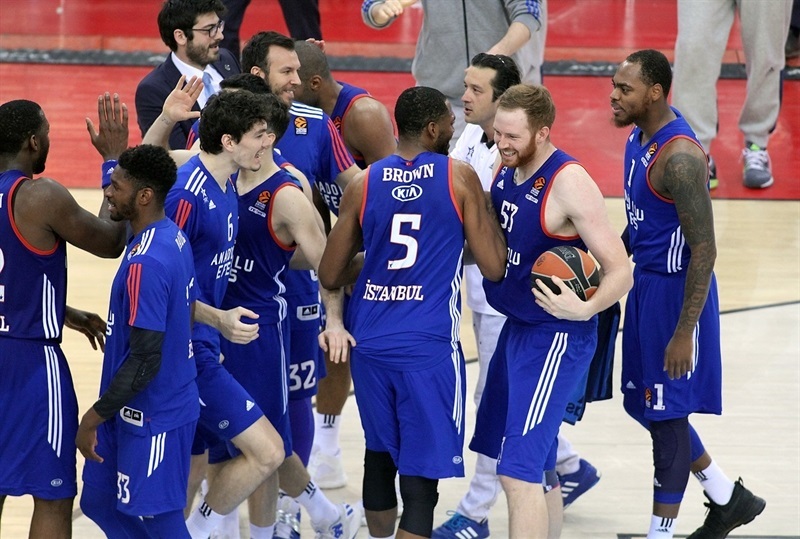 Back-to-back threes by Heurtel and Granger brought Efes right back. 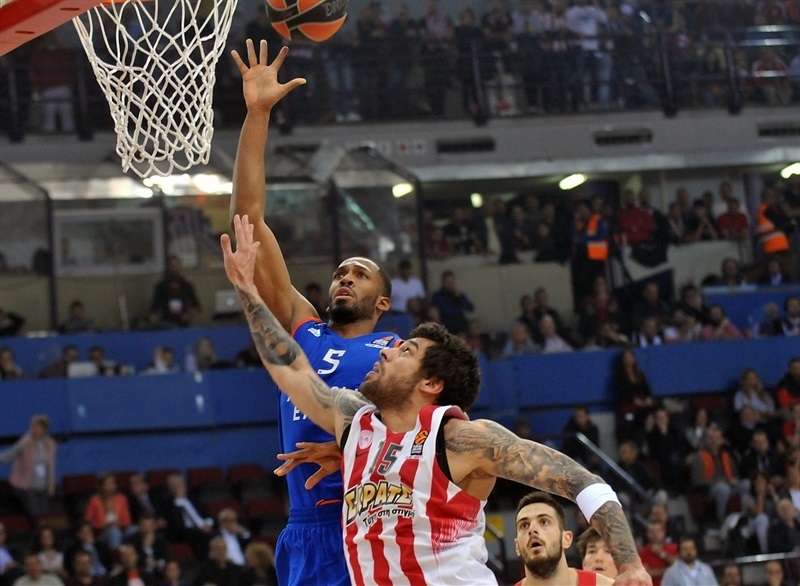 Brown dunked to put Efes in front 65-66 and the lead changed hands on each of the next three scores. Birch fouled out and Honeycutt split the resulting free throws to tie the game at 69-69 with 1:53 remaining. Derrick Brown fouled out with 1:10 left, but his replacement, Kirk, hit a long jumper for a 71-73 lead and Olympiacos missed its final two shots as the visitors raced home with the victory. 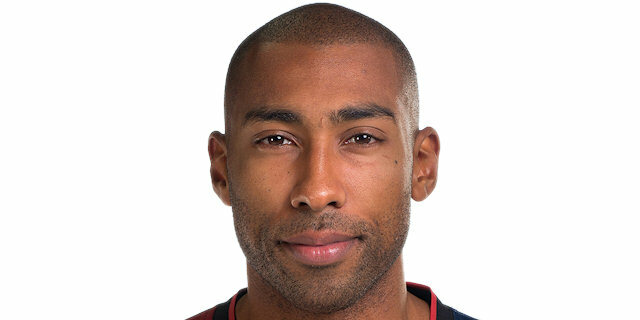 "Today we didn’t perform as we wanted, especially defensively. 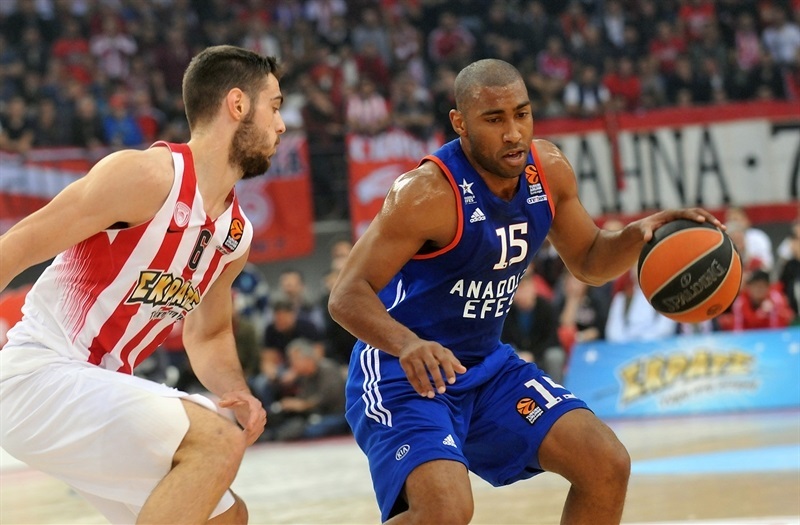 We allowed Efes to play the game as they wanted to play, especially in the first period. After that I believe in the second period we improved our game, we played much better; we allowed only 14 points. During the game we had a lot of chances to get the lead, two times I think we had a 7-8-point lead, but we were not concentrated in some crucial moments; they scored some cheap points and came back to the game, at the end it was derby in the last three minutes. We missed some shots, we missed some free throws and what I believe was most important was that in general, we didn’t have the chance to run, to play the game we want, to have a lot of fast breaks and transition points that give us some extra power and rhythm to our set offense, too. Efes broke the home-court advantage we had, but we saw during the season a lot of times that we can play on any home court and now this is the moment to keep fighting for the continuation of the series. And we must be mentally strong to go and fight for these two games [in Istanbul]. Milutinov, as you saw, fell during the game and hit his knee. He has a hematoma and that’s why he was out. I want to thank the fans who came here. Unfortunately we didn’t give them a win." 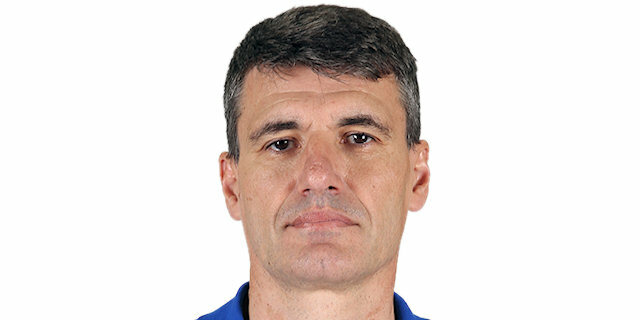 "Today is a great victory for us to keep the possibility of making it to the Final Four, because if we lost today, it would be very difficult mentally for everybody. 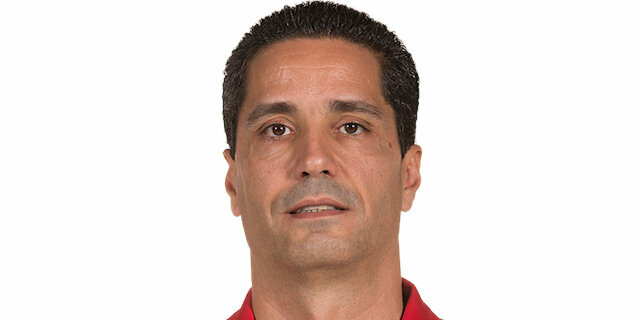 We also know that Olympiacos is a great team away, they play great basketball at home and away and it will be very extremely difficult to beat them three times, but now we have the possibility. From the beginning we played good defense, but in the first two quarters Olympiacos made a lot of three-point shots and had an advantage because of this. We stopped their offensive rebounds, we stopped their fast breaks, but we never stopped the three-point shots. In the second half we played more solid on defense and finally we won with a little luck, like always. On this court, it’s always difficult. " "I think we did a great job today. We fought till the end. They only had 10 offensive rebounds. I think we stopped some key player for them, but of course we know this was going to be hard work. We got two games at home and we have a chance to do something big. This isn’t over yet. " "We just play together. The most important thing for us was to play some defense. 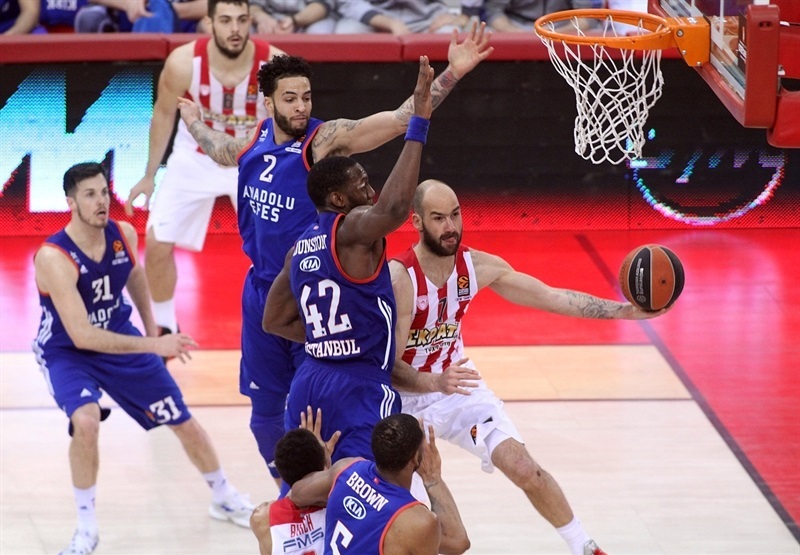 They made a lot of tough shots; Spanoulis got a little crazy in the first half. I think that, overall, we did a good job and have to keep it going. Now we go to Istanbul and we have to fight even more!"